Here are some lessons I have learned over the last number of years. I do not claim that they are the only ones that I have learned, nor that I have learned them well, but I have learned them - some the hard way, and some by observing others. They are also not in order of importance. Perhaps they will edify you. 1. Forgive and forget. Don't carry grudges against others or yourself. Bitterness defiles many. Hebrews 12:15 Looking diligently lest any man fail of the grace of God; lest any root of bitterness springing up trouble you, and thereby many be defiled… It is also troubling to hear someone else talk about their old grudges against others, so don't do it and avoid listening to those who are filled with grudges or bitterness. 2. Rejoice. Find reasons to be cheerful. If you are saved you have no excuse not to do so. Anticipate blessings. Eagerly look for reasons to be joyful and thankful. Don't wait to be taken by surprise! Ephesians 5:20 Giving thanks always for all things unto God and the Father in the name of our Lord Jesus Christ; Philippians 4:4 Rejoice in the Lord alway: and again I say, Rejoice. I ran across this handy tutorial for raising a simple neckline on a pattern this week. Here is the tutorial with instructions. Please note that this method will only work for simple necklines. Also, if the blouse, dress or jumper does not have a button or zipper opening in the back, you must be careful not to make the opening so small that you can't get your head through it! "Lady Lydia" also shows how to make new facings to match the new neckline – an important step in altering a neckline. When something is making us weary in well doing it is a good idea to consider if there is a way to change that. 2 Thessalonians 3:13 But ye, brethren, be not weary in well doing. 2) This blog was not meant to supplant the Home Maker’s Corner, but I feel like it has done this. There are things I want to write and need to write for the HMC which haven’t gotten done. I feel that the blog has in some ways gotten in the way. Also, there is no reason why I can’t write proper articles for the HMC and link to them from here as I’ve done in the past. Maybe I should even link to some of the older articles that might be of use. The HMC needs some updating and restyling in some places as well. For those who may not realize it, building and maintaining a web page is a lot more work than blogging – especially blogging through one of the blogging services that provides so much help to make it all work. 4) I’m also a bit tired of not getting some things done around here that I’d like to do. “Needing” to blog is too often an excuse to get online which, because it’s easier to browse and “research” than to actually write, leads too often to not enough getting done. This is a weakness of my own flesh, I know. But, rethinking how and how much I blog and where my time and energies should go is part of taking back this area of my life. 5) It seems needful to make adjustments to see if this blog can become less of a weight and more focused. How this will work out I’m not entirely sure yet, but I expect to make changes. 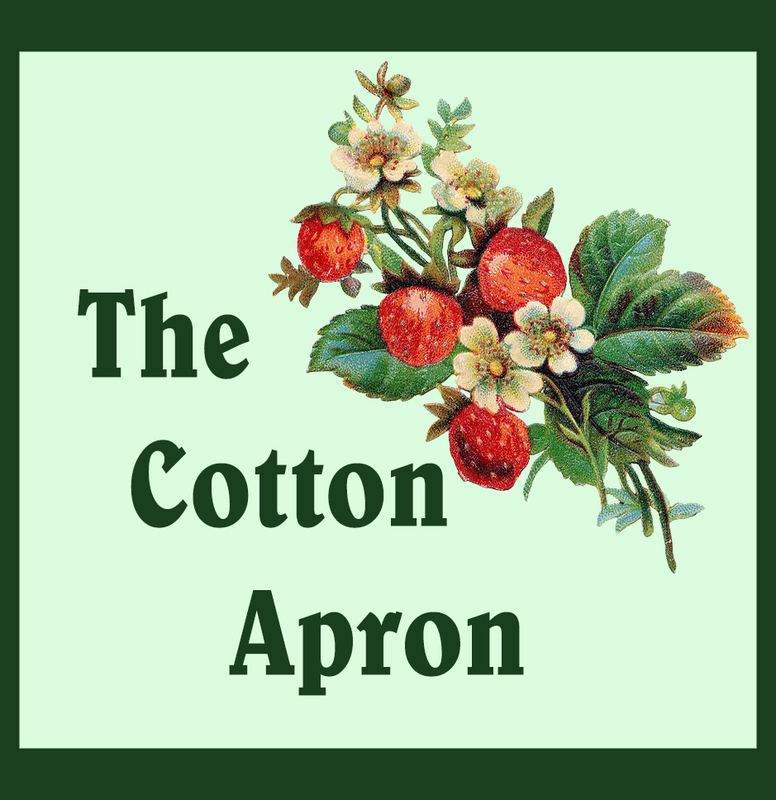 It has wandered some from the kitchen, cooking, and homemaking theme originally intended for “The Cotton Apron”. I also feel sometimes like there are not as many Bible studies and spiritual thoughts as there once was. I really enjoy quilting and sewing but, truth be told, there are a lot of quilting and sewing blogs out there. I don’t need to add my two cents. So, the sewing posts will be greatly reduced, if not eventually eliminated, or merged back into the homemaking theme posts. At this point I’m not projecting how often is enough. I’m just letting go of it mentally and we’ll see what happens. 6) I also have some long term goals which have been overshadowed by the pressing needs of so many weekly blog posts. I really want to finish the Laying Aside Weights series. I have a handful of subjects left that seem appropriate for that. I also want to do more “Hard Questions” here or on the HMC. And, last but not least, Lord willing, I want to start publishing some books. Oh, nothing unusual – mostly compilations of things I’ve already written, photo books and a collection of poems by Annie Johnson Flint. All these issues and goals relate entirely or considerably to my own management of time. My husband has told me I don’t have to post so much. I can even take a week or more off at a time. He is right. But, I also know that with some pruning, weeding, water and encouragement an overgrown plant can become more productive in a better way. I feel like this blog has become overgrown and it’s time to prune it back. Also, I’ve been allowing too many weeds of wasted computer time to grow up around it. It’s time to use the hoe and rake and get some things out of my life. That the nights are long and the days are dim? Which saddens the heart and whitens the hair? How can He care for my little life? While I live in this world where sorrows be! Then my heart cries out for a God who cares. O wonderful story of deathless love! And loves and pardons, because He cares. Can there be trouble, which He doth not share? Oh, rest in peace, for the Lord will care! Hebrews 13:5-6 Let your conversation be without covetousness; and be content with such things as ye have: for he hath said, I will never leave thee, nor forsake thee. So that we may boldly say, The Lord is my helper, and I will not fear what man shall do unto me. Here is a great blog post by Ros over at Sew Delicious about how to find good prices for fabric and other sewing supplies. This is definitely a good read for ideas if you want to conserve money and still enjoy sewing and quilting. Think also about new or newish clothing at garage/yard sales (rummage sales). Some people will offer clothing at a set price for however much you can stuff into a bag. Look for good woven cotton clothing (dresses, skirt, shirts, etc.) that can be cut up into quilt pieces or other sewing or crafting projects. Also, I like to use plain fleece instead of batting and fabric to back some “cuddle quilts”. If you’d like to try the same method keep your eyes open for fleece blankets or throws marked down after New Years and in late winter. I got some nice ones a few years ago for a remarkably low price! Now that I use them for making “cuddle quilts” I probably would buy quite a few if they had workable colors. :-) NOTE: Even if you don’t sew or quilt, marked down fleece throws and blankets make nice gifts for various occasions, so don’t pass them up just because you don’t want them for sewing. If you don’t quilt you might get them in several of the same color or large enough to make garments and other fleece items. These fainting goats belonged to our neighbor in Tennessee. Springtime. A nanny and her kid. Two kids having a good game of butting heads. I think this was the billy goat, but I’m not sure. And Christ is real from day to day. To people whom we seldom meet. Too many times the worst of me. If He does not control my tongue. Because Thy love they failed to see. And victory over little things. Thy peace for every falling tear. For Jesus' sake, to stand the test. The greatest test for all of us is how we live daily with those nearest to us. It is something to think on, to act on and to pray about! One of my favorite online quilt stores and one of my favorite quilting tutorial teachers was featured in a news item this week by a Kansas City news station. I thought it was neat to hear how their small online business and the growing passion for quilting in this country have worked together to rejuvenate a small town in the mid-west of the U.S. We need more locally run, family businesses. Here is a super easy layered salad that makes a very pretty presentation. Sprinkle over all – feta cheese crumbles (or shredded Monterey Jack), fresh oregano leaves and snipped chives. Serve with an Italian dressing. For a smaller salad just reduce the number of tomato layers and use a smaller plate. Hard Questions – Are There People God Doesn’t Want “In Church”? Hosea 4:15 Though thou, Israel, play the harlot, yet let not Judah offend; and come not ye unto Gilgal, neither go ye up to Bethaven, nor swear, The LORD liveth. This was written during the time that Israel and eventually Judah went into apostasy in the Old Testament. The two nations had separated and, as the Lord has revealed in His word, Israel – the northern nation – turned to idolatry immediately when Jeroboam set up golden calves for them to worship. However, we can learn some principles here, which are upheld by New Testament teaching as well. God does not want people who are idolaters to swear by His name nor to gather with His true believers. This is referring not to profanity, but rather to those pretending that they are God-fearing and using the talk of Jehovah-worshippers, when in fact they worship devils and have committed spiritual whoredom. This plays itself out in many ways in our day. We hear many politicians trying to “talk religion” to get the vote of Christians. Mormons try to claim they are part of “the Lord’s church” when in fact they believe heresies and blasphemous things about God and their own destiny. Also, there is no such thing as a “Christian pagan” as some try to claim. If you are this kind of person – one who professes with your mouth to worship the God of the Bible but your heart is far from God and His truth – you need to stop claiming the name of Jesus Christ and stay away from His church. OR, you need repent and forsake these ungodly things and worship God “in spirit and in truth” (John 4:23-24) – His truth, not your own idea of it. (John 17:17 Sanctify them through thy truth: thy word is truth.) God actually doesn’t want you mouthing His words and covenants pretending to be what you are not. He doesn’t want you joining with His children pretending that you worship Him as they do, when your heart is far from Him. Psalms 50:16-23 But unto the wicked God saith, What hast thou to do to declare my statutes, or that thou shouldest take my covenant in thy mouth? Seeing thou hatest instruction, and castest my words behind thee. When thou sawest a thief, then thou consentedst with him, and hast been partaker with adulterers. Thou givest thy mouth to evil, and thy tongue frameth deceit. Thou sittest and speakest against thy brother; thou slanderest thine own mother's son. These things hast thou done, and I kept silence; thou thoughtest that I was altogether such an one as thyself: but I will reprove thee, and set them in order before thine eyes. Now consider this, ye that forget God, lest I tear you in pieces, and there be none to deliver. Whoso offereth praise glorifieth me: and to him that ordereth his conversation aright will I shew the salvation of God. Shame on the churches who think they are doing God a service by drawing these people into the fellowship of the saints. Making the church “seeker friendly” has never been God’s intent. If there is not a difference between the righteous and the unrighteous, what would cause the unrighteous to desire salvation? Here we see that Paul was patient for many days. Why this was, we are not told clearly but, after some time the Apostle Paul became grieved by this damsel possessed with a devil who was giving them “free publicity”. What she was declaring was the truth, was it not? They were servants of God and they were showing the way of salvation. But, there is one main problem and quite possibly a second. 2) It is quite possible that she was disrupting their efforts. This is quite common practice for devils and evil spirits. Our families have seen and heard this in action on more than one occasion. If the devil cannot stop the preaching of the word, he will try to interrupt it or cause distractions. Just one example: A friend of my family’s attended some meetings where pastors were gathered for the sake of edifying one another. One man at the meetings was handing out dream catchers (for those who don’t know, these are talismans from American Indian spiritism – they are tools of medicine men and have a very real demonic aspect to them.) Our friend, being from the western region of the U.S. where there is sometimes more awareness of these things, was shocked by this and by the fact that some pastors were accepting them and no one was stopping the man. Then he observed that during the meetings this same man became a serious disruption during the preaching. Whenever there was an important point being made this man would begin to scream “Amen” till the words of the speaker were lost, both because of the noise and because of the “show”. By the end of the meetings, he’d gathered a little crowd of followers who thought he was very “spiritual” and great. The leaders of this meeting had the opportunity to stop this situation early – especially since it was in the assembly of believers. By letting the situation go without stopping it, it would have been hard to expose him as a tare at the end without “uprooting” a lot a people who had thought he was “very zealous”. (Matt. 13:29) Had the leaders had the sense to stop him early it would not have come to this point. This brings us to one of the important reasons that God does not want these people in His church. Romans 16:17-18 Now I beseech you, brethren, mark them which cause divisions and offences contrary to the doctrine which ye have learned; and avoid them. For they that are such serve not our Lord Jesus Christ, but their own belly; and by good words and fair speeches deceive the hearts of the simple. We who are Christ’s are commanded to mark and avoid these people. They cause divisions and offences contrary to sound doctrine. But, the reason is – “For” signifies the reason – they serve not the Lord Jesus and they deceive the hearts of the simple with their good words and fair speeches! Remember? We are talking about people who draw nigh to God with their mouth and who speak His covenants but their heart is far from Him! If we tolerate these people in the fellowship of the saints, they will deceive the hearts of the simple. The point here is that if an unbeliever comes in and hears tongues being spoken they will be confused and think the believers are crazy. But, if they hear the word of prophecy – the preaching of the word – they will be convinced of his need of salvation. How many unsaved people have “gone to church” and decided that the preacher knew all about them and was “preaching right at” them? This is the power of prophesy that Paul is talking about. It is the power of the Holy Spirit to bring words through the preacher’s mouth that directly apply to that individual that needs to believe or become more learned in the truth! And this even though the speaker himself does not know the exact need! But, this is quite different from a person who comes into the assembly of the believer with the desire to deceive the saints with their “good, godly Christian” words. Titus 1:10-11 and 16 For there are many unruly and vain talkers and deceivers, specially they of the circumcision: Whose mouths must be stopped, who subvert whole houses, teaching things which they ought not, for filthy lucre's sake…16 They profess that they know God; but in works they deny him, being abominable, and disobedient, and unto every good work reprobate. In 2 Timothy 3:1-4 we’re given a long list of people who are “all kinds of wicked”, so to speak. Then in verse 5 it continues, Having a form of godliness, but denying the power thereof: from such turn away. From. Such. Turn. Away! Why? verse 6 For of this sort are they which creep into houses, and lead captive silly women laden with sins, led away with divers lusts, They are creeps who will lead people astray – here silly women, and in Romans 16 the simple. The Lord tells us in 1 Corinthians 5:9-11, I wrote unto you in an epistle not to company with fornicators: Yet not altogether with the fornicators of this world, or with the covetous, or extortioners, or with idolaters; for then must ye needs go out of the world. But now I have written unto you not to keep company, if any man that is called a brother be a fornicator, or covetous, or an idolater, or a railer, or a drunkard, or an extortioner; with such an one no not to eat. For what have I to do to judge them also that are without? do not ye judge them that are within? But them that are without God judgeth. Therefore put away from among yourselves that wicked person. So are there people whom God does not want in His church? Yes. Those who come in to destroy, to disrupt, to deceive and to lead astray. Those who mouth words of apparent righteousness, but their hearts are far from God. Those who profess to know Him, but in works they deny him and they are abominable. Those who call themselves “Christians” but are living boldly in sin. It is not just the pastor’s and leading elders’ job to protect the assembly of believers from these things. Romans 16 is addressed to all the brethren of the church in Rome. First Corinthians is addressed to the church at Corinth. And, in 1 Corinthians 5 we see that this is our responsibility in our individual lives and homes as well as the responsibility of the leaders of the local church. By the way, I would like to submit to you that God is not impressed with the ideology that says that “The truth is the truth no matter whose mouth we find it in.” Christians will quote abominable people (Mark Twain, Kahlil Gibron, Benjamin Franklin, Arthur Conan Doyle, etc.) and then make this claim. Based upon the passage above in Psalm 50, I think it’s safe to say that God most certainly does not agree with this line of reasoning! The Lord Almighty says that the wicked have no business declaring His covenants. I hardly think He wants His saints quoting those who hate Him and His word. “Now consider this, ye that forget God, lest I tear you in pieces, and there be none to deliver.” This is not a small matter and we all need to be more cautious about our sources of “truth” on spiritual subjects! SusanClaire Mayfield from The Gourmet Quilter really likes working with 5” squares (sold in pre-cuts as “charm packs”). She has done a number of nifty, (mostly) simple designs with them and kindly made tutorials for us. :-) I’m sharing some of these today. Her explanations are simple and to the point. I personally like her style of teaching. But, these are obviously for the person who already knows the basics of sewing. :-) I have tried to list these roughly in descending order from easy to harder. Simply Sashed Four Patch – Super simple block. Disappearing Nine Patch – She apparently didn’t know the name of this block type either, but that’s what it’s being called here, as you know if you read my post last week. She is using this method to make an “I spy” quilt, so this is yet another arrangement of the colors and prints. Let’s Do the Splits – Another simple block that is very versatile and can be arranged in many interesting combinations. Tumbler Quilt – This shows a simple method for cutting tumbler pieces from 5” squares without any special template. Useful to know if you like tumblers. You’d have to adjust the angle for different sizes. Three Dimensional Bow-tie Block – This method is also used by Diane McNeil from Design Originals. However, Mrs. Mayfield uses the placement of color to make a bow tie and leaves the “pockets” open to give a 3D effect to the “bow”, which I think is clever. :-) I like this block and intend to try it out for a project I’m working on. I’m putting these two separately because the whole squares in the blocks are actually 4 1/2” rather than 5”. She has cut them down to go with half square triangle blocks she made from 5” squares – which makes them measure out at 4 1/2” when sewn. Because of this, I would be inclined to generally cut the 4 1/2” squares from yardage at the exact size needed unless I was actually working with a pre-cut charm pack and didn’t want to use yardage. For a good assortment of pre-cut 5” charm packs, visit The Missouri Star Quilt Company. My Australian sister-in-law, Clara V., wrote this sometime back and gave me permission to publish it as well. There is some very useful advice here, and it is very timely these days! Growing up, my family was never over-indulged with a flow of cash. With four daughters and a sick wife, my father was the sole provider and I remember my parents struggling to make ends meet. Years later things looked up for them - they had no conviction about single young ladies being homemakers, and each of us got a job and paid board and finally my parents started coming out on top of their finances. As a single young lady, I was not poor, however I made poor choices and before long I ended up with negative bank accounts and debts. The time when I was doing well had been brief, and here I was back to the familiarity of struggling to make ends meet. And it has been that way ever since! ~ Go shopping the least amount of times possible each month. We try to do our main shopping once each month - other than that we just drop in to pick up milk and other perishables such as extra fruit & vegetables. The more times you meander through the store, the more times you are tempted to buy a little extra here or there! Monthly shopping takes a lot of planning, and some people actually sit down and write a list of menus for a month so they will buy for the exact things they are going to cook. I tend to just bulk buy the varying ingredients I commonly use and if I have an interest in some unusual recipes, buy the extra ingredients for those too. The other thing to do is to base your monthly menu on what you are able to find that is marked down rather than sitting down and planning what you will eat before going shopping. ~ Buy in bulk. You will usually find that bulk buys work out to be less expensive in the long run. Sometimes this might require you spending a larger amount up front, but the product will last you longer! I buy meat in bulk packages, then take it home and divide it into the size portions I want, and put them in sealed bags in the freezer - this way we only buy meat once every 3 to 4 months! ~ Take a calculator with you when you do your grocery shopping (a lot of cell phones have inbuilt calculators, which makes it easier)! Sometimes you will see "specials" or "supersavers" in the store... *beware* Sometimes these products don't actually save you money! Sometimes you will notice there are two sizes of a product on the shelf, and one will be marked down and the other won't... use your calculator (or your head if you are mathematically wired!) to figure out which is actually less expensive dollar per weight. For example, pasta in a pound package might be marked down to $1.65 and the pasta in a 3 pound package is not marked down but costs $4.50. Some would say well, of course I buy the marked down product, it has to be less expensive! Do the math... you will find that the full-price bulk product still works out to cost less. Take care to always do the math, because sometimes you will find that the markdown DOES make the product cost less, and then if the smaller size product works out less, you can buy more of them to make up to the same quantity as the bulk product or whatever quantity you need to bulk buy. ~ Don't automatically go for premade goods. For starters they are often extremely unhealthy, being loaded with msg [monosodium glutamate] to enhance the flavour, or full of other additives and preservatives. Be adventurous, check through your recipe books or online and make as much as you can from scratch. If you buy the ingredients in bulk and hand make the foods, you will often find you save money in the long-run. ~ Forget your pride and forget brand names! Often generic brands or "cheap" brands will produce food that tastes exactly the same as the expensive brands, and at a much lower price!! ~ Set a budget before you go shopping, and try to never go over that set amount! ~ Always make the best use of leftovers that you can! If a lot is leftover, use it for dinner the following day rather than snacks, or freeze your leftover meals and eat them another time when you're short on time to cook! ~ If you're going out for a day adventure, take packed food rather than spending money at convenience eat-outs. You really will save a lot if you are prepared beforehand. ~ Turn off lights when they don't need to be on, and open windows whenever possible if the weather is better outside than how your house feels - save on your power, cooling and heating bill! Check for cool breezes outside regularly and open the window rather than leaving your air-conditioner on. ~ If the dishwasher is not full, don't use it! God gave us arms and washing dishes yourself can save a lot of water! ~ Make your own birthday/greeting cards - store bought ones are often sold at premium prices - whoever you are giving a card to will probably appreciate the time and effort you went to in order to create a personalised card! Alternatively, recycle cards you have received by cutting out the picture on the front and gluing it on a homemade card! ~ Recycle wrapping paper for gifts! Sometimes if you carefully remove the wrapping paper on a gift it doesn't look terribly used, or the damage can sometimes be cut off and the paper used on a smaller gift! This can really cut down on the cost of a gift! ~ Walk rather than drive. Sometimes I cannot believe how lazy some people are! I can't believe the way some people drive to their letterbox or just around the corner to run an errand when they could very well have gotten some fresh air and exercise by walking! ~ Never discard old clothes - if they are worn through such that no-one else could ever wear them, they can be handy as rags, or sometimes they can be cut down for other uses - eg. less worn parts could be used to make doll's clothes, quilts, or a range of other creative uses! ~ Don't buy your kids every toy there is, but rather make use of your creativity and imagination and make homemade gifts or buy simple gifts that can be used for a long period of time rather than toys that wear out fast! Kids do a lot better with a small quantity of toys that require imagination. If they have a huge range of toys they will often value them less and get bored of them quicker because they don't exercise their imagination! I rotate my kids' toys - we have two boxes for them and we rotate them rather than them having everything at once. The more special toys are stored away and brought out for rare occasions so they become more valuable and enjoyable, too. You ask how you learn to trust Him? Dear child, you must just let go! He knoweth all your way. He’ll not let go of you! John 10:28-30 And I give unto them eternal life; and they shall never perish, neither shall any man pluck them out of my hand. My Father, which gave them me, is greater than all; and no man is able to pluck them out of my Father's hand. I and my Father are one. This is a favorite poem of mine. As with Annie Johnson Flint, I look forward to meeting this sweet lady in heaven. The precious fragrance that was pressed out of her life of pain in the form of poetry is one of those rare treasures that the Lord brings to us through very few of His vessels. This is perhaps just as well. Most of us could not suffer as sweetly and productively as Miss Annie and Mrs. Martha did. But, what blessings and comfort came to us through their great trials! If you want a simple quilt but are not really looking for something as simplistic and a plain nine patch, this might be a good option for you. I want to try something along these lines myself sometime. Diane says it’s fine to print her instructions for your own use. I like her style of block a little better because it is more organized color-wise, which makes it easier to create a design that is more orderly. Personally I like a mix of scrappy and order. She put hers together in a much more scrappy style using a different fabric for all the outside squares and only keeping the middle square consistent. Her method is also to put the cut block back together in such a manner that there are no seams to match. This method could be especially nice for a beginner. If you like the really scrappy look this might suit you well. These are not actual prints that you can purchase. I cheated and used photos of my own. I photo shopped them to make them look a little more like fabrics. :-) My style is fairly modern, though I like more traditional fabrics, so some of these may look a little different to the traditional minded quilter or viewer. Block 1 tiled with some rotation. Block 2 tiled with rotation. Block 3 tiled with rotation. This is my favorite arrangement!